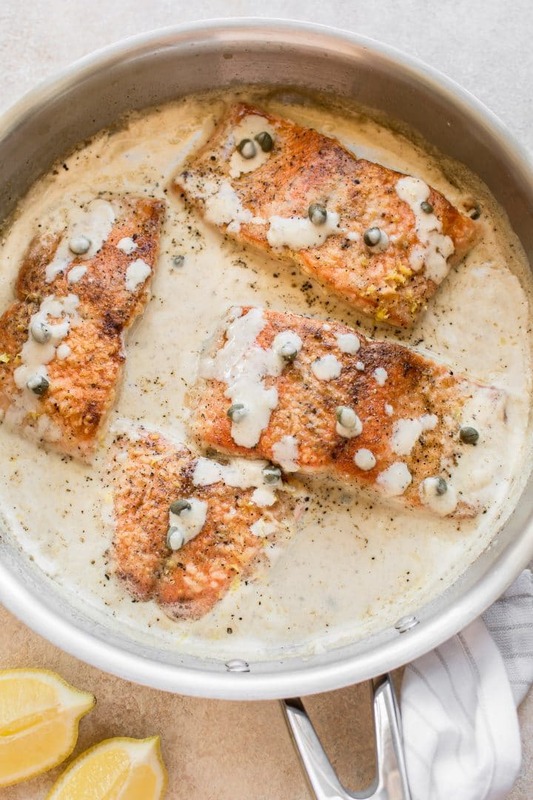 This creamy salmon piccata recipe is fast and totally delicious! 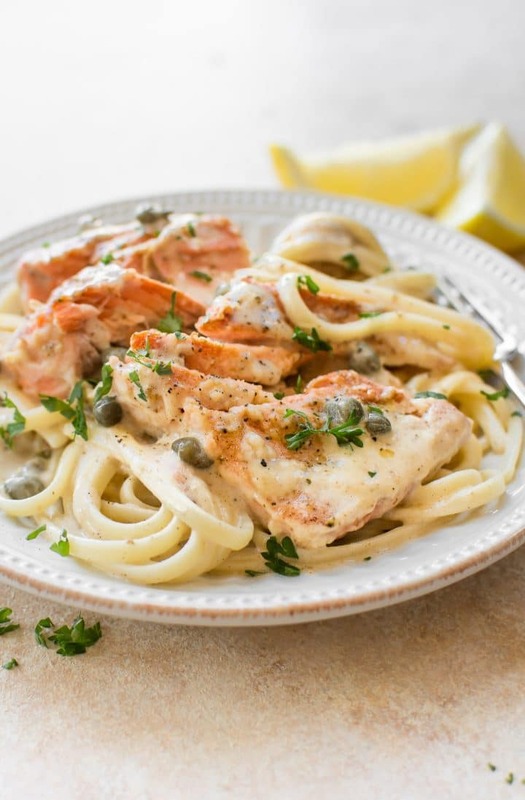 All you need is 20 minutes to make this tender salmon in a lemon caper cream sauce. If you’re looking for an easy and elegant meal, here it is. 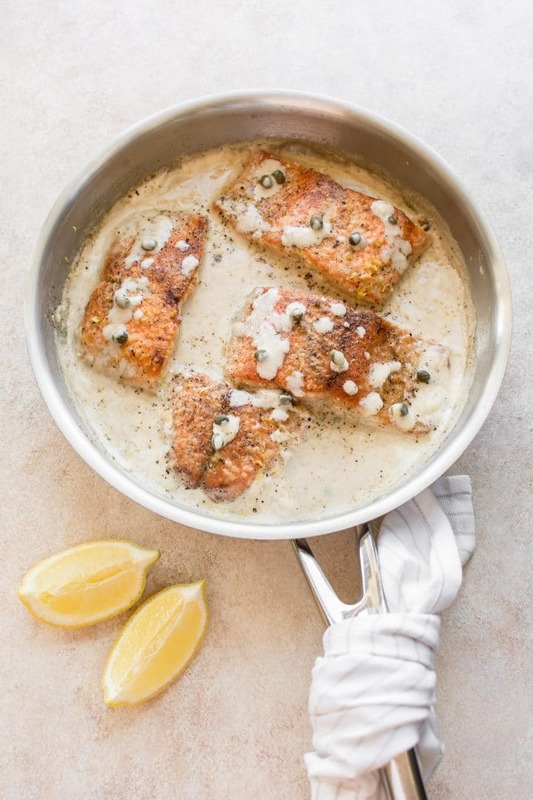 This lemon salmon piccata is excellent for a weeknight dinner but also good enough for company. It’s typically meat or fish that’s sautéed in a sauce that has lemon, butter and spices. You will usually see capers in Italian-American versions e.g. chicken piccata. Most piccata sauces either use chicken broth/stock or white wine. Garlic also usually makes an appearance. I made a shrimp piccata recipe a while back if you’re interested. Using flour to coat the salmon helps thicken the sauce up quickly without overcooking the fish. Season the salmon and dredge each piece in flour on all sides. Sauté the salmon in butter and oil for 3-4 min./side then take it out of the pan. Deglaze the pan with the chicken broth or white wine, lemon juice + zest, and capers. Cook for a minute or two. Stir in the cream and let it thicken, then add the fish back to the pan and cook until salmon is ready. Season as needed. 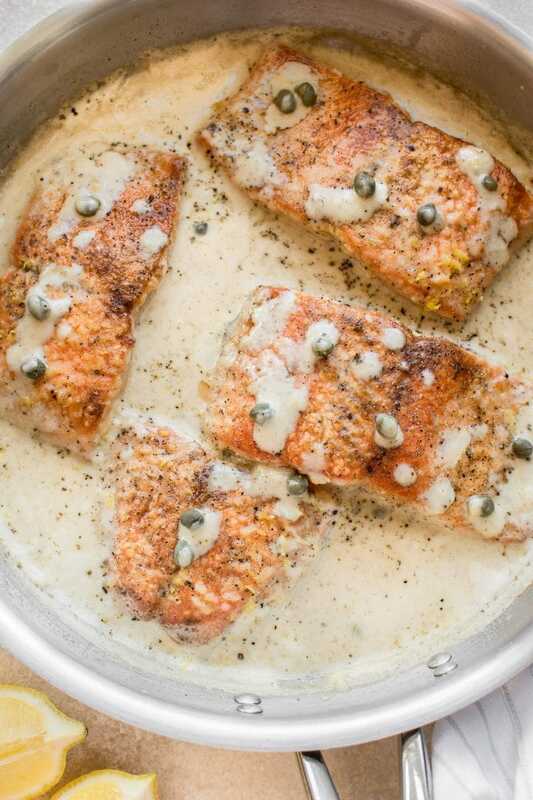 This creamy lemon butter sauce for salmon is delectable! Pasta, rice, or mashed potatoes work very well. I love serving corn with creamy sauces as well. I also like to serve a simple salad with lettuce, tomatoes, and a light vinaigrette dressing with creamy dishes – it brightens the whole meal. If you want this to be a true 20 minute complete meal, I suggest making it with pasta. Start boiling the water for the pasta before you start making the fish, and everything will be ready around the same time. 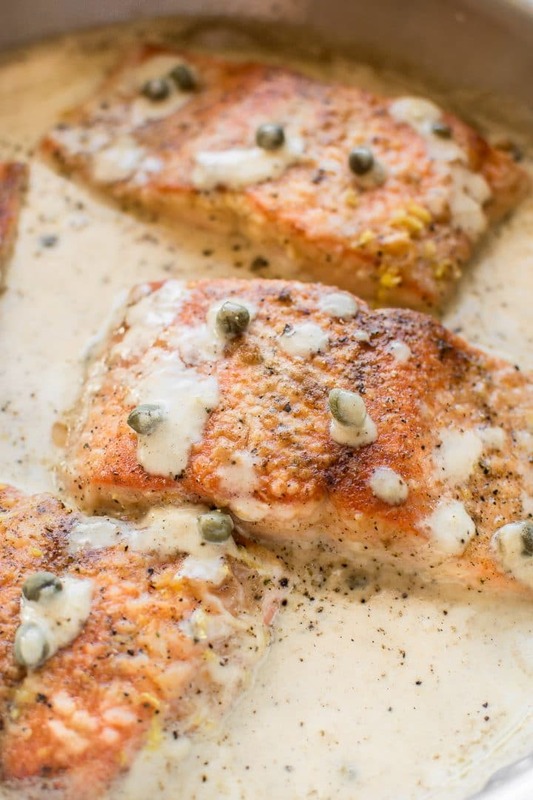 Will you make this salmon piccata with a creamy lemon sauce? Cut your salmon into 4 pieces. Sprinkle it with the garlic powder and season it generously with salt & pepper. Dredge each piece in flour on all sides. Add the butter and oil to a skillet over medium-high heat. When it's hot, add the fish. Cook it for 3-4 minutes/side or until it's browned. Be sure not to overcook the fish; it shouldn't be cooked fully yet. Remove salmon to a plate and set aside. Add the chicken broth, lemon juice/zest, and capers. Let it simmer for a minute or two. And the salmon back into the pan. Cook for a few more minutes (you may want to turn the heat down) until it's cooked through and it flakes easily with a fork. Season with extra salt & pepper as needed. Serve immediately. This is the lemon zester I use and recommend for this recipe. You may also like my creamy Tuscan salmon recipe or my creamy lemon salmon. I love salmon and can’t wait to make this! I am absolutely drooling over here Natasha! That sauce looks amazing! Aww thanks, Mary Ann!! 🙂 It was definitely tasty. Looks so creamy and delicious! Love a new salmon recipe! Looks delicious! Can’t wait to try!!! Totally drooling over here! This is a must make! Love this twist on a piccata! Just made this…it was very good! The hubby doesn’t like salmon so I made him chicken and I had the salmon. I just added a bit more salt to taste. Will make again.